Just got back from my morning walk , while on vacation on the Big Island, so I thought I’d pen a few random thoughts. Traveling on United Airlines was never a great experience, but now that Continental has taken over, it’s worse. San Jose Mercury News had a nice story on the problem this week. People affected most are veteran travelers who use miles and upgrades. Not a good segment to anger since they make up most of your profits. For my wife and I, it meant an unnecessarily late departure since gate agents had to come on to plane to sort out upgrades to First Class. Took an extra 30 minutes because the computers couldn’t deal with it. We flew coach because they only had one seat to offer. In the past we have been upgraded with no problem. Otherwise flight was fine – no bumps. Had a nice long chat with flight attendants about what’s going on. They are not happy. But they gave us champagne because they knew we were upset about the seating issues. Business on the island seems to be really picking up. Mauna Lani and Orchid Hotels seem very busy. Only new business at The Shoppes is a taco stand. Juice 101, where my wife gets her smoothies etc, was booming as was grocery store, as usual. Spoke to one local dive shop who said it’s best business has been, in three years. Rental agents say some units are at 95% occupancy over first three months of the year. Although they are hesitant to predict summer they are optimistic. They are even considering raising rates. Tourism is up some from Japan. JAL cancelled direct flights to Kona last year, but there are three charters coming this month. Louis Vuitton at Kings Shops is happy since it’s usually their first stop. Yen is dropping, so we’ll see. On tour at Hawaiian Vanilla Company. 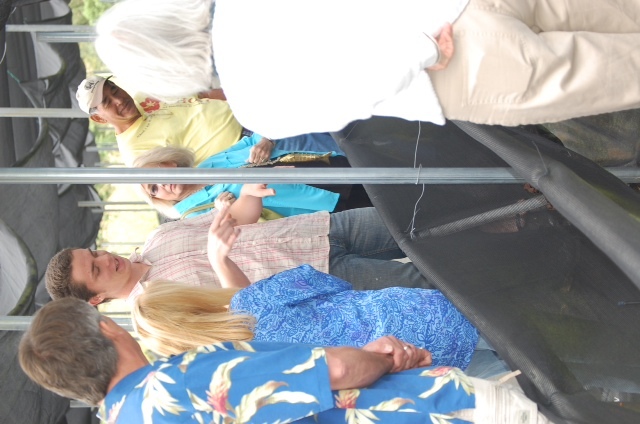 The owner's son explains to visitors how the orchids are grown. Real Estate folks say the market is improving significantly. One long-term renter I spoke to said she was having trouble finding a place for next year, since so many owners were able to rent short term for more money, or were trying to sell. Whales seem to be only mammals staying away. Saw a few this morning, but until today, they were few and far between. Locals don’t have an explanation. Trip to Hawaiian Vanilla Company was worth the drive to the Hilo side. 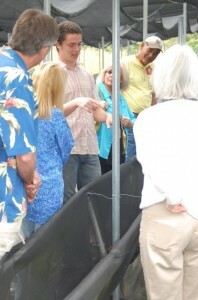 Tour, which included lunch, was given by 18-year-old son of the owner, very poised. He knows his vanilla beans.Coincidentally our friends, Mike and Sallie, who live here, happened to mention the night before that they want to visit Madagascar – which is the world’s largest vanilla producer. Mexico is second. Trade winds were pretty strong on the first two days, making the golf courses a real challenge, but they have let up a bit today. Went to the farmer’s market Tuesday. Bought bread so I’ll probably be gaining weight, despite the fact that I’ve been running on my walk. No snow on Mauna Kea, but rain has been good this year and island residents are happy the drought has lessened at bit. Of course no, Hawaiian post would be complete without a gas price update. Yes, regular gas is approaching $5.00 per gallon. Rent a bike.